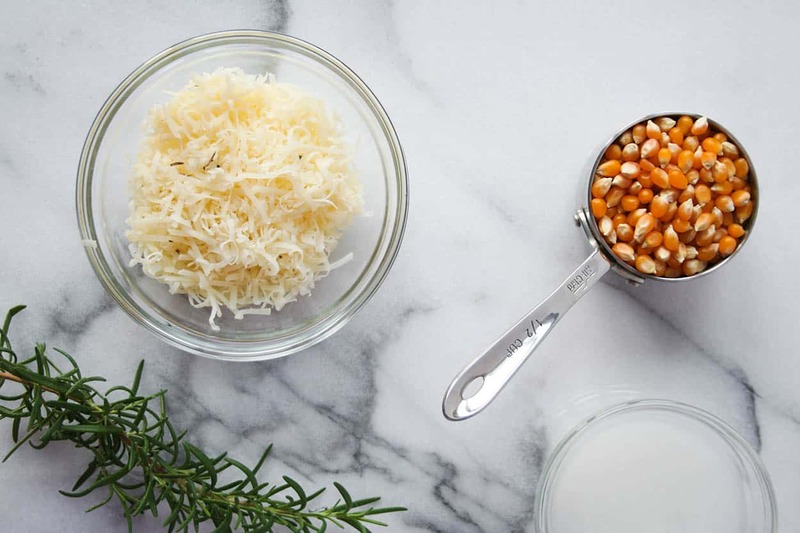 This simple rosemary asiago popcorn is a savory spin on the classic treat. 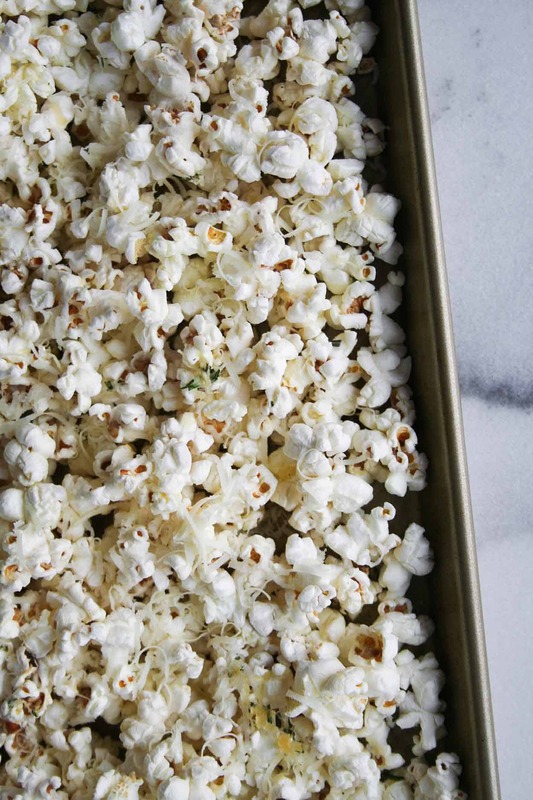 Only 4 ingredients and 10 minutes stand between you and your movie night snack! There is a time and a place for popcorn, amiright? Usually, it is in a dark movie theater where no one can see the XL bag that you have just smothered in butter. Or maybe at the fair where you can buy that cute white and red box of this classic snack. My time and place for popcorn is a night like last night when Pat is not home and I can justify eating popcorn for dinner. Pat had a traumatic popcorn experience as a kid (don’t ask… there was lots of throwing up involved) and now he has no desire to ever have popcorn. EVER. <— And this is pretty traumatic for me because sometimes all I want to do is eat just popcorn for dinner. Well last night was one of those nights – Pat was out with a friend and I was at home with a craving for popcorn. I’ve been growing rosemary on my deck and loving the ease of adding it into recipes, so I thought let’s add it in!! I popped the popcorn on the stovetop with a super simple method I read about here. When you do this, be sure to use a heavy bottomed pot. I used my largest All Clad, but a dutch oven would work well too. I topped it with my favorite Trader Joe’s Asiago Cheese with Rosemary and decided to add some more of the fresh stuff for good measure. Dinner is served! Add the coconut oil and 3 popcorn kernels to a large, heavy bottomed pot. I used my largest All Clad for this. Cover and cook over medium-high heat until all 3 kernels pop. Take the pot off the heat, set a timer for 30 seconds, remove the three kernels out of the pot, and add the rest of the popcorn kernels. Put the pot back on the heat. As the popcorn is cooking, shake the pot occasionally until the popping slows down. Listen as the kernels pop; as the popping slows to where there are a few seconds between each pop, turn off the heat and take off the lid. Sprinkle with olive oil and salt. Toss to combine. 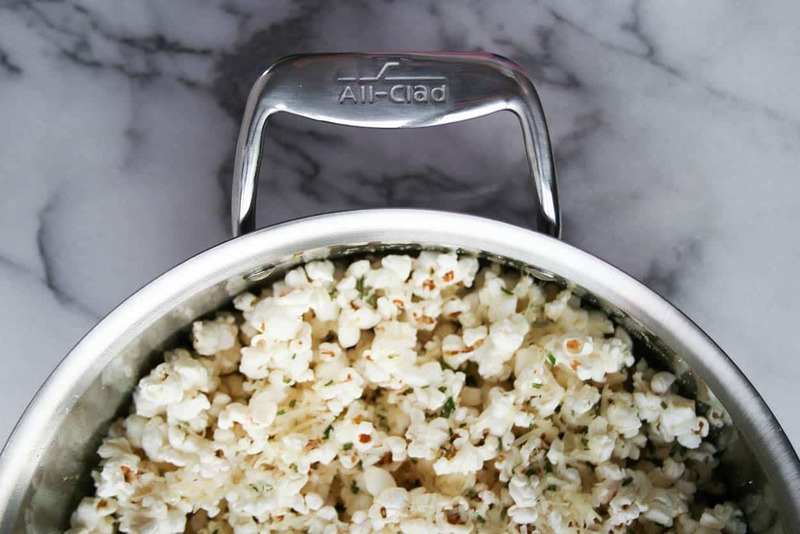 Dump popcorn out onto baking sheet while it is hot, cover with grated cheese and rosemary and allow cheese to melt. 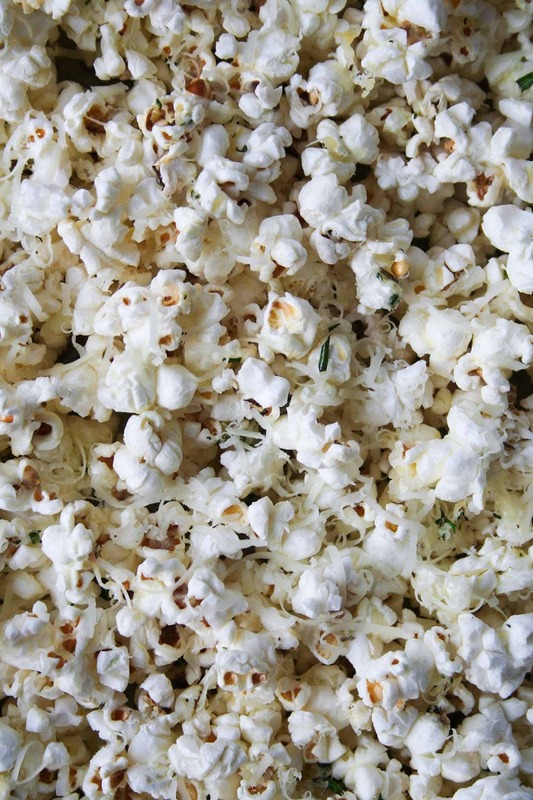 Your turn: What is your favorite popcorn topping? 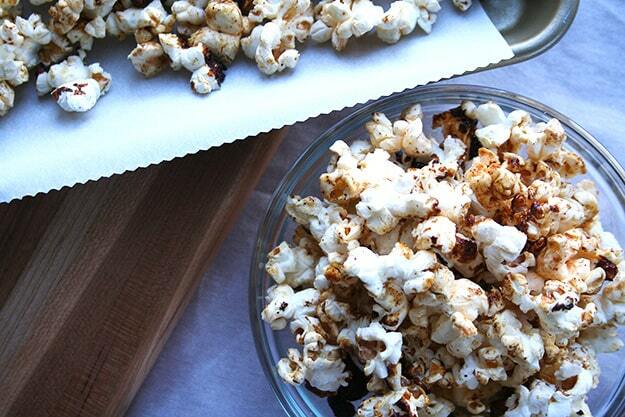 Looking for another popcorn recipe? Be sure to check out my Sweet and Spicy Popcorn! You caught me! I have a secret mind reading talent ? WOAH! This sounds like a flavor explosion! Absolutely nothing wrong with popcorn for dinner! There is absolutely nothing wrong with popcorn for dinner! I’ve been there many times before 🙂 I also love stovetop popcorn because you can flavor it however you want. Topping with fresh rosemary sounds delicious. I’m glad we’re in agreement! Sometimes I make it with jalapenos too… adding a little juice from a jar of sliced jalapenos to the oil as it pops and then adding chopped peppers on top. It is SO spicy! 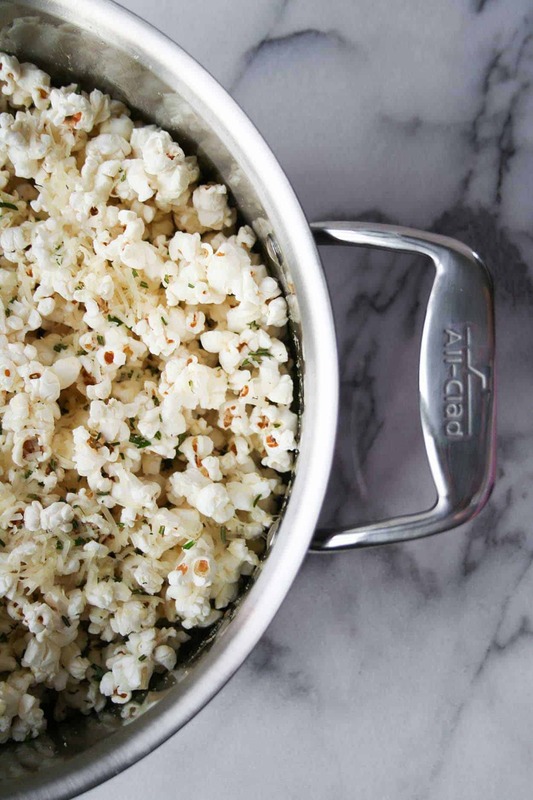 Hi and thanks for the rosemary popcorn recipe. besides having a very pleasant taste, its also a healthy snack. You are so welcome – I’m glad you enjoyed it!